Just like what is happening to Real Madrid following Cristiano Ronaldo's departure this summer, many expected Barcelona to suffer in Lionel Messi's absence after the playmaker was recently ruled out of action for weeks. 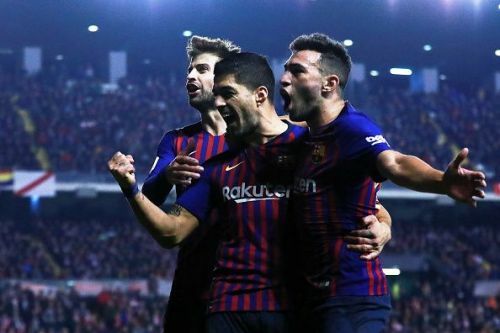 However, against the odds, La Blaugrana have recorded satisfying victories in 4 of the last 5 matches they have played ever since the Argentine has been sidelined. The team responded perfectly, and that was aided by the fact that they got themselves together and worked as a unit to achieve incredible results, covering the absence of the playmaker with great determination and togetherness. Luis Suarez was deadly in front of goal, Arthur Melo was unmatchable in the middle of the pitch, Sergio Busquets was at his obvious best, Jordi Alba was unstoppable on the left flank, Ter Stegen was unbeatable between the sticks, Ousmane Dembele and Arturo Vidal were super subs, while the likes of Clement Lenglet, Gerard Pique, Sergi Roberto, Nelson Semedo, Philippe Coutinho, and Ivan Rakitic all contributed immensely to ensure Messi's absence was not obviously felt.